Car Free Earth Day 2019 is an annual car-free event held on the Saturday immediately following Earth Day. The Event opens thirty blocks of Broadway from Times Square to Union Square from 9am to 3pm. 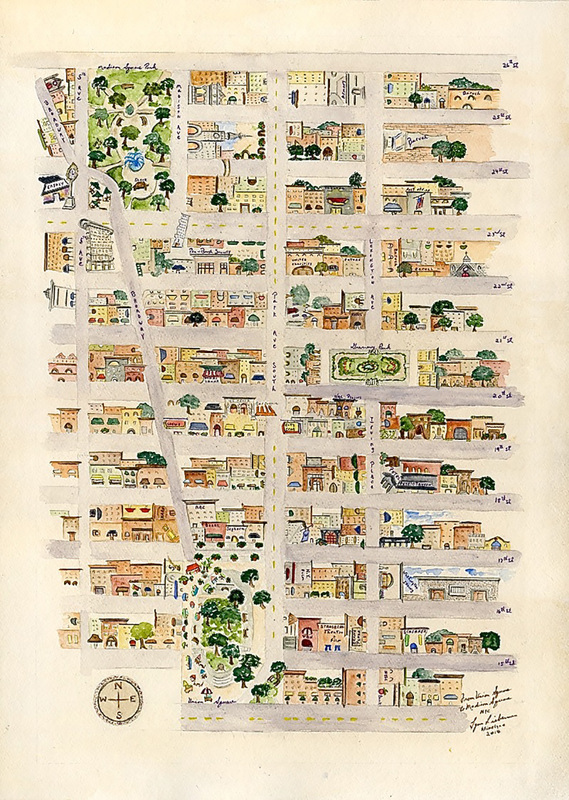 Within this area, there are six rest stop that include Times Square (42nd Street & Broadway); The Garment District (38th Street & Broadway); Herald Square (34th Street & Broadway); City Zone (26th Street & Broadway); Flatiron (23rd Street & Broadway); and Union Square (17th Street & Broadway). Programming and activités presented by (AIA New York + NYC Department of Transportation (DOT). AIANY gave a heads-up on an immersive experience focused on public right-of-way design featuring temporary potted plantings on Broadway’s surface between 19th and 20th Streets, with places for musicians to entertain, moveable tables and chairs open to the public, and grassy play areas. 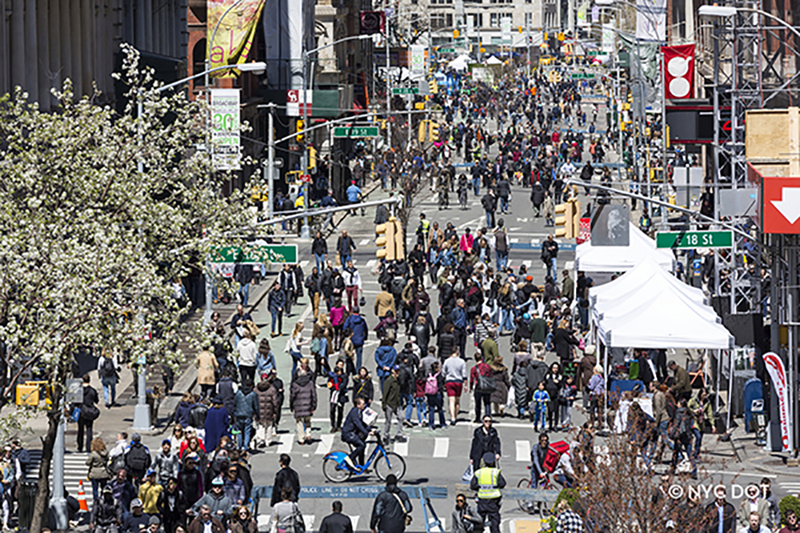 In addition to Times Square to Union Square, Car Free Earth Day events and programming will take place in many other parts of the City. The list below will continue to grow until the day of the Event. 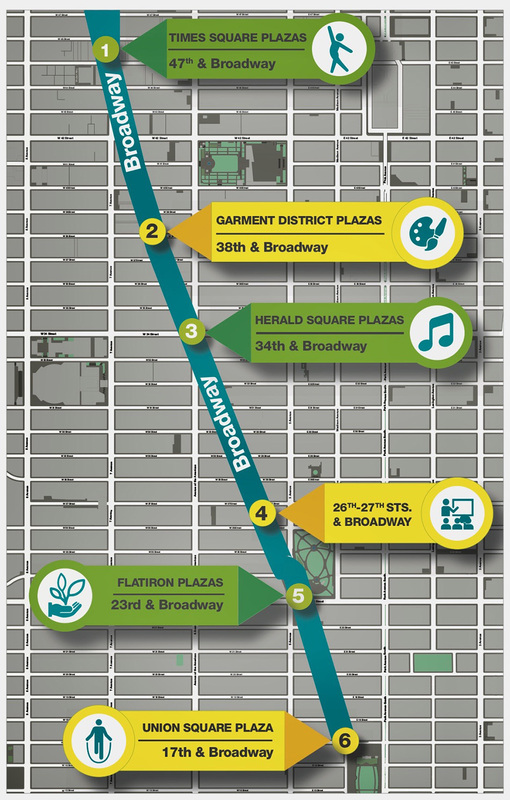 Car Free Earth Day in Downtown Brooklyn from 11am to 3pm on the plaza at Albee Square. Harlem Grown’s Earth Day Celebration will be held on Saturday, April 20th from 11am to 3pm at 118 West 134th Street. Join WeAct for an Earth Day Harlem Fun Run on April 22 from 7-9pm at Marcus Garvey Park. In partnership with Harlem Shake! Visit NYC’s Great Green Sites on Monday, April 22nd in the West Village and Chelsea for Earth Day 5K Green Tour. Tickets Here. Car Free Uptown will take place on St. Nicholas Avenue between 181 and 190 Streets. Car Free Earth Day Background ~ The New York City Department of Transportation’s (NYCDOT) mission is to provide for the safe, efficient, environmentally responsible movement of people and goods in the City of New York and to maintain and enhance the transportation infrastructure crucial to the economic vitality and quality of life of our primary customers, City residents. Environmental programming is offered by City agencies and nonprofit organizations along the route to promote activism and education surrounding climate change, sustainability and other relevant topics. Visit DOT Flickr for images of past CFED events, www.flickr.com/nycstreets. DOT ART + Event Programming Background ~ Since the launch of the DOT Art Program in October 2008, DOT Art has installed over 300 engaging temporary art installations throughout New York City. The Program partners with community-based organizations and artists to present murals, sculptures, projections, performances and programming on DOT property. Dance, music, theatre, workshops and public art installations contribute to the DOT Art event programming roster each year as part of Summer Streets and Car Free Earth Day. Visit DOT Flickr for images of past DOT Art projects, www.flickr.com/nycstreets.